Thank you Alejandra and Remezcla. We’re so proud to be part of this #latinoowned list! Get your dose of Verano Porteño here or in Osme Perfumery Miami. With inspiration taken from a walk around Buenos Aires in the summer, Verano Porteño is what it says on the tin: a bright, sunny (citrusy) smell held down by a light jasmine. FRASSAÏ, which has the additional distinction of being woman-owned, has its only boutique in Buenos Aires, so you can almost picture summer air sweeping into the shop to inspire the perfume. From the brilliant Argentinian brand Frassai, Verano Porteño is vibrant, fresh and full of lively florals. With accents of cardamom, Calabrian bergamot, imperial jasmine and vetyver. This past week I have been sampling fragrances by New York fragrance house FRASSAÏ. Natalia Outeda created @frassai with @givaudanperfumeperfumers Yann Vasnier, Olivier Gillotin, @rodrigofloresrouxand Roxanne Kirkpatrick. Natalia’s focus for her brand is a sustainable and cruelty-free collection that is inspired by her experiences living in Argentina and the U.S. There are currently five fragrances in the collection. Stockist details are on Frassaï’s website. Tian Di runs a sharp spicy incense note in parallel with a velvety, woody note that has facets of powder and an overlay of fuzzy peach skin. Blondine has soft floral notes with delicate and ethereal musk. The fragrance also has cocoa and a salted butter caramel accord. This description sounds sweet but the gourmand notes (thankfully) don’t overpower the rest of the fragrance. A Fuego Lento is a limited edition fragrance in the collection. It’s a solar white floral that radiates orange flower and jasmine sambac. Jasmine’s creaminess has been intensified, leading nicely into a warm base of tolu balsam and a suede accord. For me Teisenddu is the most intriguing fragrance in the collection. Inspiration came from torta negra, a cake made with rum, dried fruit and nuts. 19th century Welsh immigrants who settled in Patagonia introduced the cake to Argentina. Teisenddu will be available in the US from December and features a spicy fresh kick of juniper and nutmeg before notes of rum, dark sugar and leather take over. My favourite fragrance in the collection is Verano Porteño. Created by perfumer Rodrigo Flores-Roux, the fragrance is a celebration of summer in Buenos Aires when the streets come alive with the scent of jasmine. There is something so catchy in this fragrance. The hook comes from a bitter green citrus note that pairs perfectly with jasmine. This citrus note with Calabrian bergamot is fizzy, energetic and to me it offers up something a little bit salty. This leads to dewy petals of jasmine on a backdrop of vetiver and ambrette seed. This is how I want my summer to smell! FRASSAÏ BLONDINE, TIAN DI AND VERANO PORTEÑO REVIEWED BY CASSIANO SILVA OF PERFUMART BRAZIL. We reveal the inspiration behind the new fragrances, A FUEGO LENTO and TEISENDDU, walk you through the mysterious ingredient everyone's talking about: flouve odorante, and will even tell you why you should NOT smell coffee beans plus teach you how to fold a test strip! two distinct takes on jasmine composed by the Master of white flowers. Each one creates a singular mood; one is bright and solar, a morning blooming jasmine with magnolia, citrus, vetiver and patchouli. The other, a simmering night-blooming jasmine with suede and the coumarin hay scent of flouveodorante. Both contain FRASSAÏ’s signature ingredient: maté absolute, lifting and supporting the floralcy with grace. The Perfumes Guide 2018 by Luca Turin and Tania Sanchez is now avialable on Amazon.com. We are truly honored at FRASSAÏ to have our three fragrances: Blondine, Tian Di and Verano Porteño not only included in this exhaustive guide, with wonderful reviews on all three scents. We are also humbled to read the graceful words about the art direction of our founder, Natalia Outeda, and proud to recive the rarely given 4-star rating on all perfumes ⭐️⭐️⭐️⭐️. This perfume guide has been released ten years after Luca & Tania released the A-Z Guide. It is the result of an exhaustive and passionate (not always fabulous) review of 1,200 fragrances that were launched in the global fragrance market during the last decade, 2008-2018. 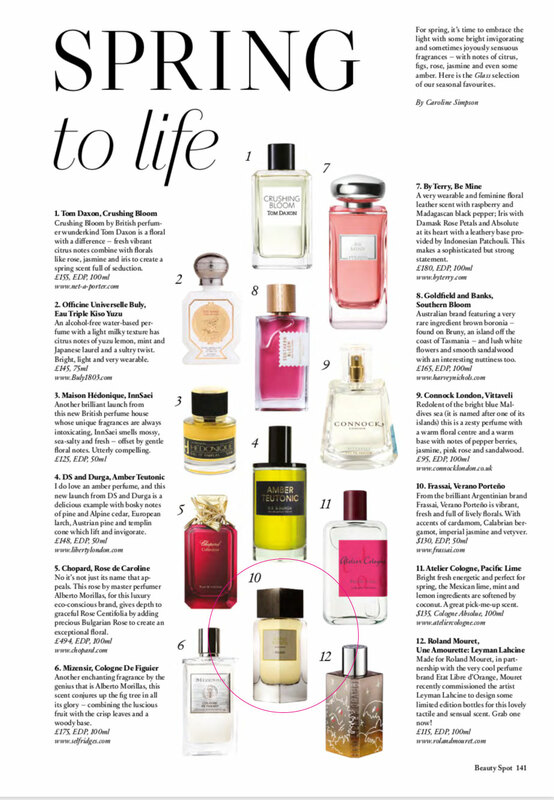 As a novelty, it incorporates a much needed coverage of the niche perfume market, that includes us! Although we didn't get around to tally up the star ratings, the authors claim that half of the 1,200 fragrances reviewed, only received one to two star ratings - only 20 out of these got 5. We are immensely proud to have a solid 4-stars on all three of our scents. Below is a snippet of what Luca Turin thinks about FRASSAÏ and the eaux de parfum in the collection. However, if you are interested in perfume, we highly recommend that you get your copy, sit down in a comfy chair with beverage (and perfume) of choice in hand, and take a leisurely afternoon to enjoy this wonderfully written book. Only available on Kindle for now (although it's readable on your browser and iPhone) - paperback and hardcover coming soon. "(Natalia) must have been a paragon evaluator and art director, because every one of her fragrances is evidence of someone with a goal, a steady hand at the helm, and a deep understanding of the strengths of her chosen perfumers. For a start, the perfumes smell good all the way, from a sumptuous, heady top note via a solid, beautifully worked out, Lauder-level heart (when will the snobs finally realize Lauder under art director Karyn Khoury was the American Guerlain? ), to that rarest of things these days, a really good drydown... all are of stellar quality." BLONDINE**** "...slowly develops into one of the most interesting orientals in a long time, smooth, rich, devoid of clichés"
TIAN DI**** "what is remarkable about Tian Di, and strongly suggests an ingenious assemblage, is the solidity of the accord (easily twenty-four hours on strip) not budging away from a glorious, slanting-sunlight glow. Great stuff. VERANO PORTEÑO**** "It turns out a smile can be smelled. I cannot find another way to describe the floral start... this one has a twist that goes beyond those stately creatures (Beyond Paradise, Oscar) ... which gives the top note a flirty lift that first promises to turn heads, then to break hearts. @thescentedgent: Today I'm sampling Verano Porteno by @frassai With dominant notes of citron, calabrian bergamot, jasmine, clementine and magnolia. I was kindly sent the new line of fragrances from Frassai some time ago, for which I apologise for taking my time with a sample post. So here's to a new chapter of exploring fragrances worn by the women in my life. Of course fragrances have no gender, it all comes down to wearing what you enjoy. Verano Porteno opens with the refreshing notes of citron, bergamot and tangerine. Its sweet and effervescent, which a touch of tartness from the citron to keep it grounded. Close behind the citruses, and the beautiful white florals of jasmine and magnolia, smooth, inviting and enveloping. It really does evoke a summers day in my mind, as the warm winds blow in a beautiful floral aroma. Vetiver adds a touch of green sharpness, that works well with the tartness of the citron. Cardamom sits deeply within the blend, but offers a hint of sweet spice, a note that is always welcome in my book. Finally ambrette seeds round off the scent with a musk like note. In terms of performance I got projection of 2-3 hours and longevity of 8+ hours, it certainly performed well on both mine and my girlfriends skin. Of the three fragrances in the line from Frassai, I selected Verano Porteno to discuss first as it could certainly be a unisex fragrance. Verano Porteno is truly a beautiful scent, and provides a reminder of summer whatever the weather. I'd certainly love my girlfriend to wear this, but I think she's going to have to share. How do you choose the fragrance you will wear on a particular day? Please share below in the comments! Special thanks to Michelyn Camen and Ida Meister.